These little potholders are what I've been working on lately. I put down my knitting needles for a while and reached for my crochet hook instead. 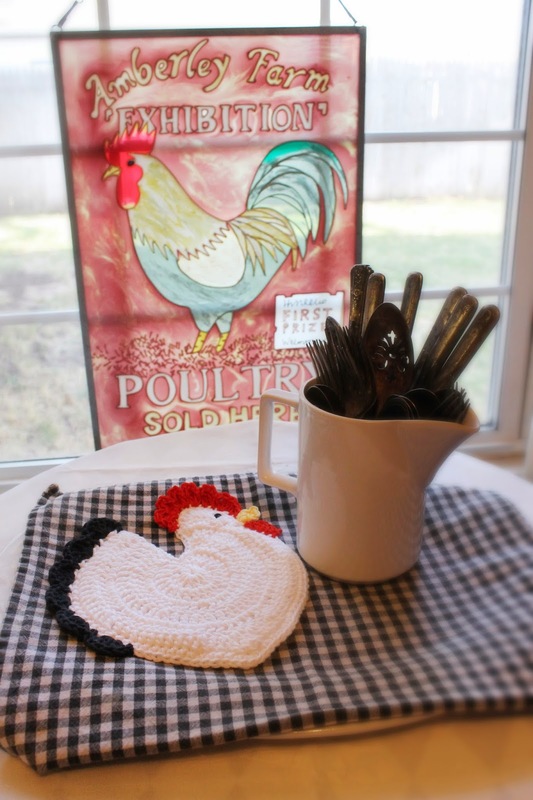 I wanted something quick and fun to do and found this whimsical chicken potholder pattern on Ravelry. There's always been a soft spot in my heart for chickens. I've never had any in real life but I look forward to the day when I can have some. I do lean towards to the country farmhouse decor in my kitchen so these little hens will fit right in. ......Why stop at just one? The tan one on the left is fuller and rounder because I used Peaches and Cream cotton yarn on it as opposed to the white one on the right where I used Hobby Lobby's I Love This Cotton yarn. I don't mind the difference at all. I rather like how they each took on a personality all their own. If you haven't already, I hope you try this pattern someday. Doesn't every kitchen need one of these? 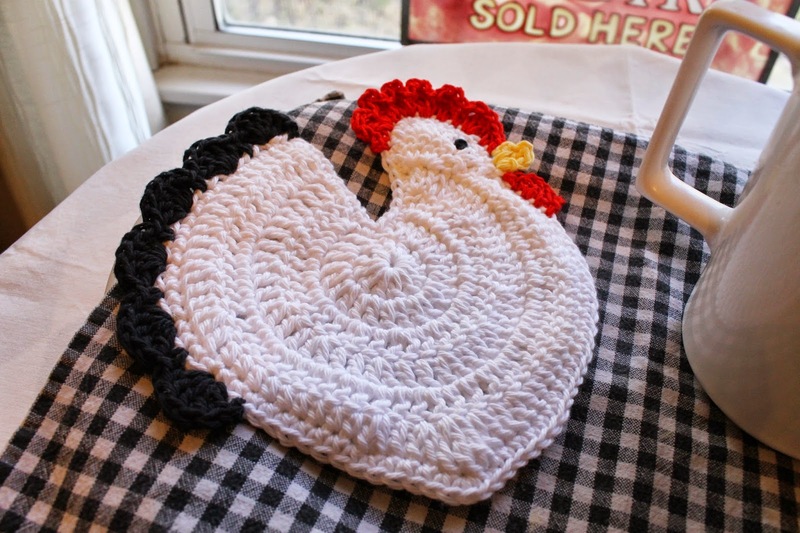 I love your Hen Potholder,came out so cute....lovely heart shape for her body. Happy weekend ! Really cute! They need some skinny legs and three toes on each foot! Ha-ha-ha. I've been looking at and making a lot of potholders lately. Those are really cute and will make great gifts. I love them, the shape of the body is so cute. I will have to check out the pattern it would be perfect in my kitchen. Have a wonderful weekend. Sweet and cute !!! Love your little chickens ! Those are adorable. My mother's country kitchen has roosters all over it. I think she needs a few hens to balance it out. They're so sweet! I might try making one too. Oh my they are adorable!! 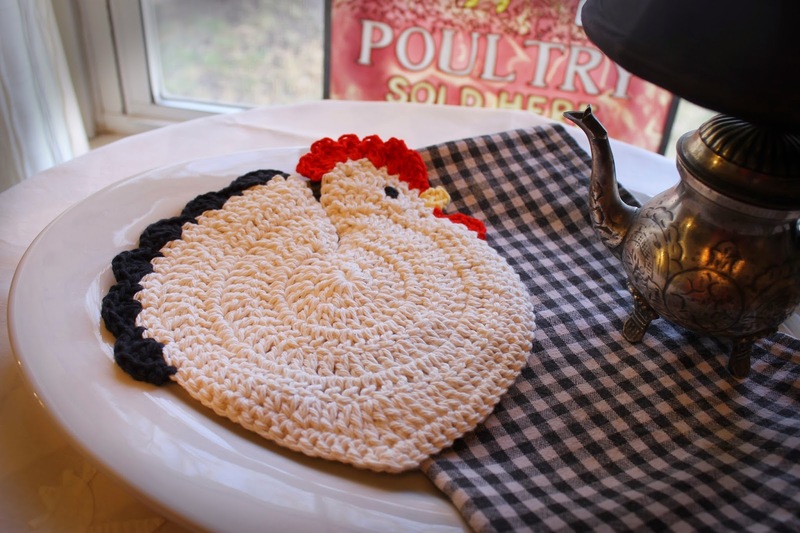 I must make these for my mom as she loves chickens! 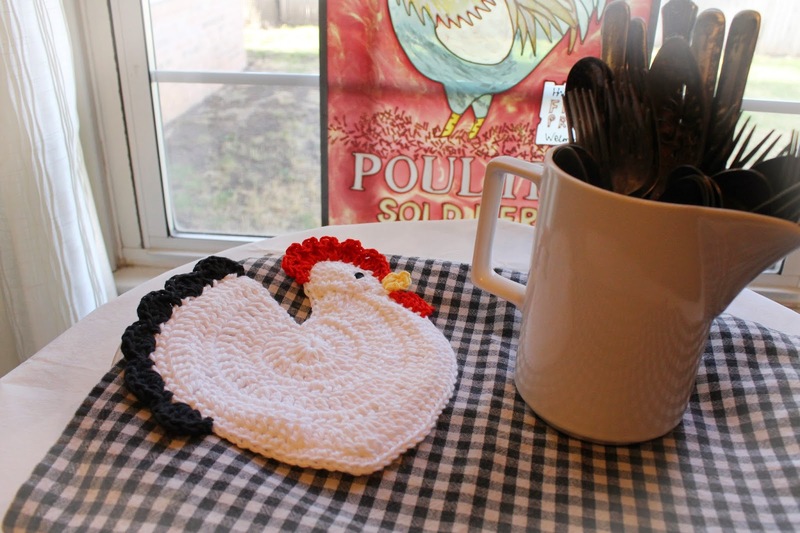 Hi Beca, wow these chicken pot holders are just adorable and I love them. You are constantly amazing me with what you create. You always think of something fun to crochet. Have a wonderful weekend. OMG! They are so adorable! One of my coworkers has chickens and I keep trying to get her to let me borrow them for a couple days to take care of the bugs in my garden. LOL! I love this pattern! Going to save and try that for sure! Where can I find the pattern for this?